Tilly: A Story of Hope and Resilience is a beautifully written story that follows the main character through her life and tells of the struggles she encounters with loss, separation, alcohol dependency and recovery. This book is loosely based on Monique Gray Smith’s own life. 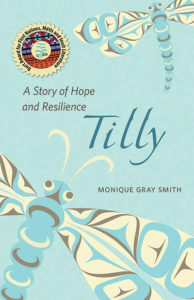 Gray Smith does an excellent job with writing about Tilly’s relationships with the people in her life which help her with moving forward in recovery and learning her cultural and traditional ways. This book also gives the reader some insight into historical events of Canada’s Aboriginal people. Classroom Connections: This book could be used in a high school English or Social Studies class. There could be rich discussions around the Aboriginal cultural teachings and traditions as well as the history of Aboriginal people in Canada. This story lends itself well for discussion about character and how a character changes throughout a story, as well as how other characters affect the main character. The glossary would be helpful to students to understand the terms and history mentioned in the story. Questions for discussion are included at the back of the novel. This review is from Canadian Teacher Magazine’s Jan/Feb 2016 issue.